You mean I can be tall?? Before we start talking about hard numbers, though, we should probably discuss our methodology and where we’re getting these stats from. While it’s hard to get numbers on exact heights for the any of the cast, we’re lucky in that Usagi’s height is given as 150cm.1 Fortunately for us, it’s not too difficult to find scans of the character design sheets used by the anime artists when animating Sailor Moon, so we can extrapolate the heights of the other characters from there. Going with the assumption that time was reset after the fight with Beryl or, if you prefer, the theory that the Dark Kingdom Arc was actually short lived, we have every reason to believe that Usagi’s height didn’t change much, so we can keep using our 150cm figure for Sailor Moon R.
Things start to get complicated once we reach Sailor Moon S, however, since we know that Usagi has a birthday and that they’ve moved forward in school. Here, we will use Mamoru as a base for comparison and extrapolate numbers from there. Men, on average stop growing by the time they reach their early 20s,2 so it’s reasonably safe to say that his height is probably set. I couldn’t find any other official materials that showed the characters standing reasonably straight and with mutual characters (to use as a ruler), so unfortunately I don’t have a complete data-set for Sailor Moon R, SuperS, or Stars. If anyone has any materials, I’d be more than happy to check and add to this table! So what you can see here is that not only does Usagi actually get taller, but you can see that all of the other characters get taller as well. 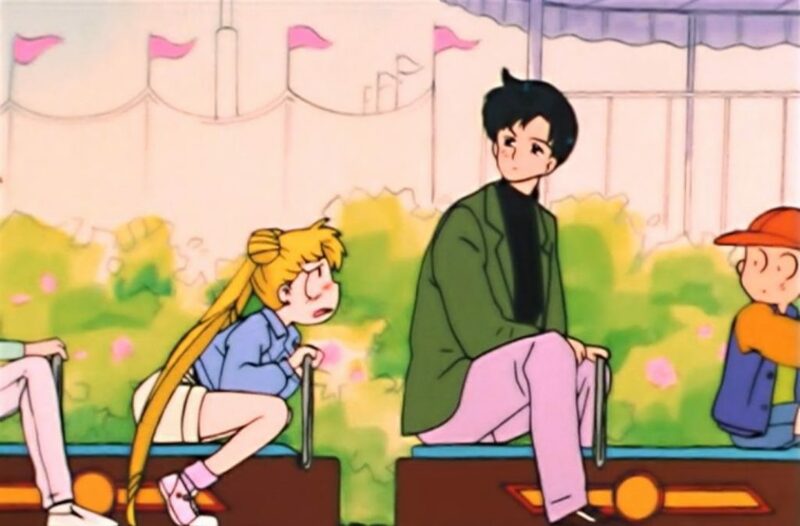 Even using the questionable math on Mamoru’s height being the same, you can see that Usagi rapidly caught up to Ami, with just a 6cm difference in height when it used to be over double that, at a difference of 13cm in the original. 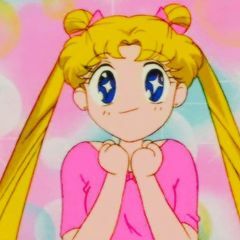 Interestingly enough, Usagi’s height puts her actually at the low end of girls her age, with the average height of fourteen year old girls in Japan being 156.5cm.3 Her height from Sailor Moon S and beyond is right about in-line with the national averages, or even a little on the tall side. That might explain why Usagi’s hungry all the time – she was in the middle of a massive growth spurt! So there you have it! It turns out that Usagi did indeed grow as the series progressed, as did the other Sailor Soldiers! I’m still on the lookout for more pictures that can be used to narrow down their heights, so if you know where to find other character design sheets for Sailor Moon R, SuperS, or Stars, I’d appreciate a heads up! ← Were Haruka and Michiru Viewed as Lesbians in 1990s Japan? Do you any tough estimates at all for their stars height, or adult height? I find it interesting to realize that all of them besides Usagi are between tall and really tall. Even Rei is borderline amazon. Unfortunately, it’s really hard to gauge with Stars since we don’t have any characters who should have stayed the same height to use as a yard stick, kinda like Mamoru did for Sailor Moon S. Setsuna may work since a 19~20 year old woman is unlikely to have been growing too much, but I’m having a hard time finding any reference sketches with her next to the main cast. If you know where to find any, I’d love to take a look! 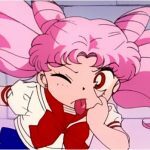 Maybe at the tail end of R when Chibiusa returns to Crystal Tokyo? IIRC they all stand next to eachother there. I’ve been giving this issue some more thought (probably more thought than a grown adult should reasonably give to finding out how tall anime characters are…), and I’ve been thinking that Luna may be a good substitute to use as a ‘yard stick’ of sorts to measure the senshi across seasons. Odds are that she wouldn’t be changing in size much (if at all) and she appears with more characters, so she could make a good baseline. I’ll need to take a look into this shortly! I’ve never bothered to convert the heights to feet and inches, some of the results surprised me. Mamoru is 6’3″ (taller than I expected), Haruka is 6’1″ (same thing), Michiru is 5’8″… and Chibiusa began at 2’9″ and ended at 3’8″. It makes me laugh how ridiculously small they originally made her. It’s kinda weird… even at her tallest, she’s about the same height as a 5-6 year old. Sure keeps true to the chibi in her name! Is Usagi’s 158 cm official? Her height is confirmed in a Japanese character book at 150cm. Footnote 1 provides the source. I’m pretty sure the only character given an official height was Usagi. Any idea where you saw the 168 for Makoto? I saw maybe WikiMoon? That Usagi was 150 when the series starts. I dont remember right now the heights for the other girls. 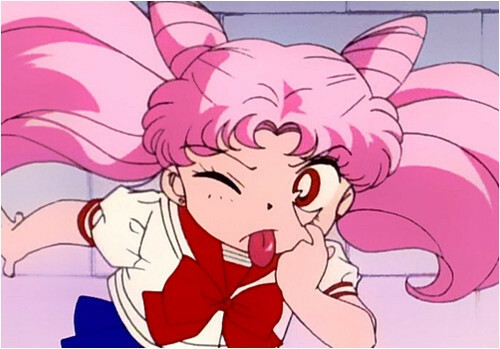 But not counting Chibiusa and Hotaru, Usagi is the shortest. To the best of my knowledge, we’ve only ever gotten one official height for any character in the series — Usagi at 150cm, which comes from an official character guide published after the first season wrapped up. As for the other heights you see around the internet, they’re all estimates that comes from a fan FAQ written up in the late 1990s. They’re generally not too far off, I think, but it’s worth knowing that they’re all estimates, just like the numbers I’ve written here. Is this height chart official? Yep! 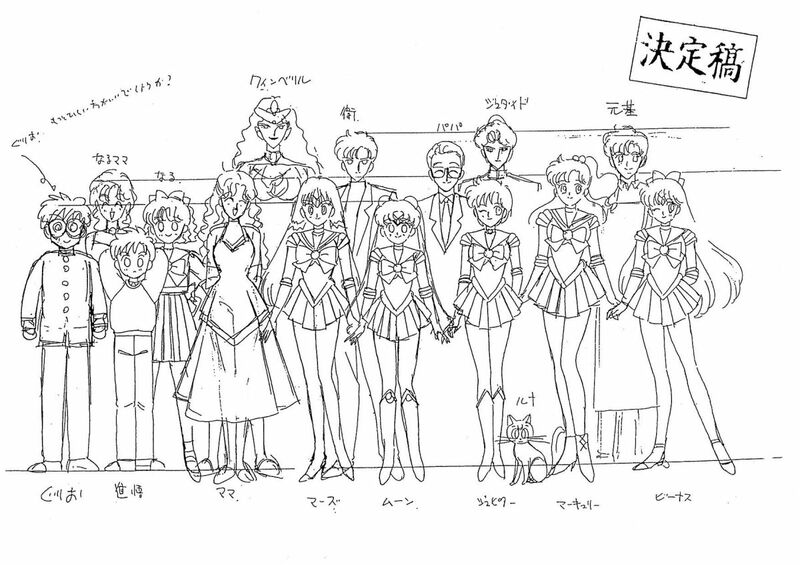 That’s an official height chart for Sailor Moon Crystal. It’s a bit hard to go by since they all have their shoes (with heels!) one, but it’s still interesting to see! But on the height chart of your article,senshis have also heels,isnt’it? Maybe it’s just be, but the ones used in the original series appear to be adjusted (i.e., moved below the base line) to account for the heels. In particular, look at Rei’s feet in the old and new one. In the new one, she is clearly being lined up from her heels. In your opinion,how tall is Black Lady? How tall is Black Lady? How tall are Black Lady,Naru and Umino?